The other day I read Justin Levy’s post on going mobile with WPtouch and just had to experiment. I haven’t previously had a mobile specific version so it’s definitely an exciting move. Here’s a quick round up of my experience. I call myself a developer so I went with a snazzy App Store icon as my mobile banner image (see end of the post). WPtouch has a pretty good selection of images although they’re mostly centered around the iPhone. If nothing meets your needs you’re more than welcome to upload a custom file. Linking of my AdSense and Analytics accounts. Must haves…AdSense to collect those occasional pennys and Analytics to obviously to continue to understand how people flow through the site. Adding both was EXTREMELY easy to do with a custom section for each. WPtouch gives you the option to display a ‘desktop’ (i.e. non-mobile) version of your website to users on their first visit and include the ability to toggle mobile vs. desktop in your theme footer. I get the potential draw but if you’re going to go mobile, I’m not sure why you wouldn’t always default mobile and allow them to switch back if they want. Anyways, you can also change what icon is used for each post and how much information about the post is shown (e.g. just the title, title and a teaser, tags, categories, etc). I played with the settings a bit but I think that’s really more of a personal choice…at least until I get time to test and study analytic data. I understand it’s a mobile device and landscape is limited but a second ‘title’ (under NathanHJones.com below) would be ideal. Obviously, each blog owner would need to be smart about how it was used. Better AdSense rendering. This may be slightly out of the WPtouch developers hands but I noticed that AdSense ads show up very boxy compared to the smooth WPtouch design. I don’t know if that’s anything they can fix or perhaps me just being new to AdSense mobile but it didn’t exactly flow together. 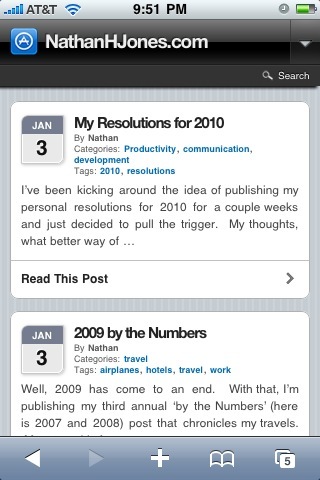 If you’re mobile version is powered by WPtouch leave a comment and let me know what you think! 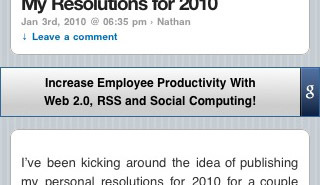 Finally, here’s a fullscreen shot of NathanHJones.com…the mobile version…from my iPhone. I’ve been kicking around the idea of publishing my personal resolutions for 2010 for a couple weeks and just decided to pull the trigger. My thoughts, what better way of pushing myself to follow through than to publish them on the web for all to see. I’ll try to take a couple checkpoints throughout the year to let you know how I’m progressing. Blog more – 3-4 times per month is my target. I plan on blogging about my iPhone development experience as well as about some topics I’ve been hoarding from my day job on implementing SAP SRM 7.0. Clean up my resume and create a web-ready version (linked on this blog obviously). 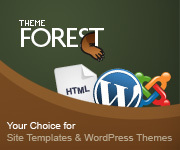 Develop a new website – I suspect this will likely be to complement the iPhone app but I would like to build a custom WordPress theme for nathanhjones.com. Reach 500 followers and 1,500 tweets on Twitter. I hover between 140 and 150 followers and just hit 600 tweets today. Exercise more – 4-5 times per week. Throughout the last couple years I have been working out 2-4 times a week but I would like to raise the bar a bit at 4 to 5 times to help get in better shape and shed a few pounds. Lower my golf score. Notice I didn’t say handicap there . Over the last few years I’ve only been able to play a couple times a year because work has consumed so much of my time. My goal for 2010 is to play more and get my average score consistently in the 90′s (high 90′s is ok by me for this year). I wanted to list 10 (for some reason that sounded like such a nice, even number) but this is all I could muster today. If I manage to achieve all of this with time to spare in 2010 (unlikely, unless you find me a new job)…I’ll add a couple more. By the way, how does everyone feel about the fact that years will now almost always be prefaced with ‘twenty’ instead of ‘two-thousand’?!? Well, 2009 has come to an end. With that, I’m publishing my third annual ‘by the Numbers’ (here is 2007 and 2008) post that chronicles my travels. Most travel is for business but there were a couple personal trips that made the list. Visited 3 states (NC, IL, PA) other than VA. Oh, and one island – Aruba!! It looks like my travel for at least the first half of 2010 will be on par with 2009. We’ll see what the new year brings though!! You are currently browsing the NathanHJones.com blog archives for January, 2010.